Best in class teams deliver embedded products with fewer than 0.1 bugs per thousand lines of code. They consistently beat the schedule, without grueling overtime. Does that sound like your team? If not, what action are you taking to improve your team's results? Hoping for things to get better won't change anything. Unfortunately few firmware groups keep metrics, but those that do average a 40% decrease in schedule and an order of magnitude improvement in bug rates after implementing the ideas from the Better Firmware Faster class. There's more information here. Zeroplus has donated four of their logic analyzers (which I reviewed here) which we'll be giving away to lucky attendees at these seminars. While in Denmark I'll be giving a couple of talks at the Electronics of Tomorrow conference May 8-9 in Herning. Jack's latest blog: We Shoot for the Moon. Jacob Beningo wrote about frying his I2C tool, and gives good advice for isolating serial debug instruments. 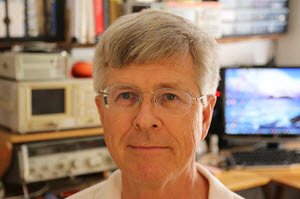 Tim Hoerauf won the second of the two Keysight DSOX1204G scopes last month. 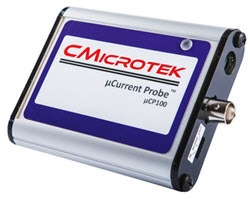 Thanks to the fine folks at Cmicrotek, this month's giveaway is (your choice) either a µCP100 or µCP120 current probe. These are instruments that measure the current consumption of low-power IoT-type systems. I reviewed them here. One intriguing feature found on some digital scopes is the so-called "color temperature." (A lousy name, if you ask me, as "color temperature" has a well-defined meaning in physics). The scope sweeps rapidly, acquiring thousands of sweeps a second. With color temperature enabled, each pixel is colored to indicate the probability of that value. Red indicates the most common value; blue the least. 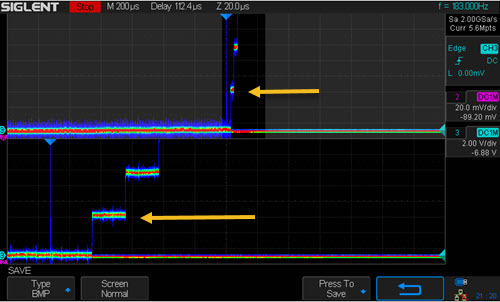 The following screen shot is from a Siglent SDS2304X scope which is displaying the output of a DAC whose value is incrementing. The top portion (upper arrow) has the scope gain cranked way up; the bottom part is that same value zoomed in. Note that the most common value measured by the scope is red, but due to some system noise, there's yellow and blue above and below the nominal value. Color temperature could be useful in monitoring noise, and I imagine would really dress up eye diagrams. Yes, we traditionally use intensity to gauge these, but the colors would be a bit more quantitative. I'd like to come up with a trick to use this feature for debugging firmware - but so far, can't. Suggestions? When testing code we're faced with two problems that can seem intractable. First, who or what is the oracle (the entity that determines if a test result is correct)? The second is the issue of generating large quantities of tests. Fuzz testing can create lots of tests, but given that there's no oracle it is mostly useful for seeing if the code crashes, not whether a correct result occurred. There are some tools that will build vast numbers of unit tests. LDRA's Unit, for instance, can build enormous sets of unit tests by examining the code. I've seen that tool generate 50,000 lines of test code from a 10KLOC code base. In many cases it can derive the oracle, though sometimes it's up to the user to supply the expected answers. But what about situations like processing visual fields? Is the system properly identifying a pedestrian, no matter what the lighting might be, or if there's a raging snowstorm? Or, suppose you've written code that computes sin(x) to 1000 decimal places. How do you test that? Enter metamorphic testing (MT), a twenty-year-old idea that eliminates the need for an oracle while building test cases more or less automatically. It's getting a lot of traction in applications like machine learning and vision processing, where data sets can be huge. The March issue of the Communications of the ACM has an interesting article about using metamorphic testing to test LIDAR data. It cites an example of a vision system in a drone. The code worked, actually quite well. But if the sun was at just the right (wrong?) angle to the visual field the drone did silly things. Researchers fed actual images to the code, and then images corrupted by various random rotations of the sun angle. MT relies on creating metamorphic relations (MR). These are characteristics of the system that must hold true, but that result in many different inputs. For instance, for the sin(x) problem one could test for sin(x) = -sin(π + x), within the precision one is striving for. In a vision system, feed an image to a camera then add snow/noise; both should pick out the pedestrian. Randomly (and automatically) rotate and manipulate the added distortion and insure the system still picks out the pedestrian. Another example of MT: suppose you have a function that computes the standard deviation of many inputs. Randomly shuffle the order of the inputs and check for identical results. Though I have not read any studies about this, I would think MT would be even more effective with the ample use of assert() macros. MT alone isn't enough; it can guarantee the relations between test cases, but not absolute errors. If a sine routine returns sin(30°) = 2.5 and sin(180° + 30°) = -2.5 this particular MT test will pass even though the answer is bogus. In the real world, one defines many MRs with the hope that flaws will pop up. Still, in some cases MT can be a valuable adjunct to a test regime. There were companies that warrantied software at specific or low, defect rates. Two methods they used: Cleanroom Software Engineering and Praxis Correct-by-Construction. The SPARK book has a detailed description of Praxis's method with an example. Price-wise, one article said Praxis charged about 50% extra for warrantied software. Cleanroom projects ranged anywhere from that to actually cheaper due to knocking out bugs earlier when they're cheap to fix. They're also from high-assurance philosophy of actually engineering software. This sub-field encourages avoiding known problems, reusing known-good methods, and keeping everything simple. An easy one relevant to this and your memory safety quote is just using Ada or SPARK to avoid tons of errors. Fuzzing and program analysis (eg RVI's RV-Match) on C code helps, too. Another was hierarchical layering with only downward calls to make compositional analysis easier. Eiffel had SCOOP to make concurrency more like sequential programming. Now Rust's borrow-checker, while being a headache, is proving absence of temporal errors without mathematical verification. Tock OS is an embedded example. There's CompSci projects doing that for information flows, checking error handling, safe linking, safer/secure web apps, and so on. Rarely ever applied or built on by developers. The reason is folks don't care. If F/OSS, it's not their itch. If commercial, they're not liable. In the market, they're also pushed to add complexity into the systems. They're financially rewarded for tossing it together quickly without strong verification. It's why I favor regulation and/or legal liability that addresses things we can easily prevent, detect, and/or fix. We can start with memory safety, spatial and temporal, on top of reviews and test generators. Outside regulations, a voluntary approach in market might be warranty saying that specific classes of problems don't exist in this product or (response/penalty here). Alternatively, the warranty might be tied to a broad range of testing: white box, acceptance, and fuzzing. It will work on some, fail safe with optional debugging info on others. If so, it meets the warranty. There's a lot of possibilities. The most exciting is folks apply our current tech for safe and secure software. Praxis (now Altran) and Galois Inc are examples that do. Others start doing whatever they can afford. If not, I'll still settle for memory-safe languages with interface checks (eg Design by Contract) and automated, test generation. That costs almost nothing to do today with few to no specialists required. I'm having a little trouble getting my mind around this product as it's so vast, but am fascinated by the possibilities. 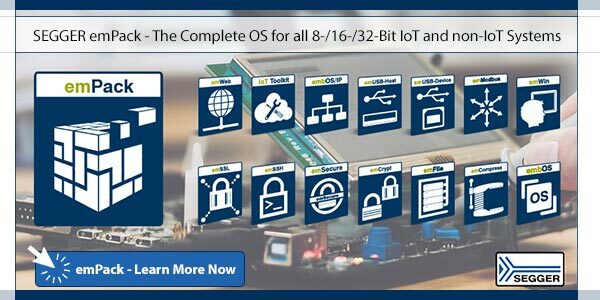 From the developers: "LabRecon allows one to build rich graphical interfaces for remote IoT (Internet of Things) or local measurement and control applications. A drag-and-drop panel builder and graphical 'Wiring' programming environment allows one to easily build an interface and create the operating logic for any project. This operating logic can be further expanded using the 'code link' interface to text based languages such as Python, Java, C#, Visual Basic, etc. A USB connected 'Breadboard Experimentor' circuit board or LabRecon chip provides the measurement and control link. "One powerful feature is the 'Measurement Wizard', wherein one can choose from a built-in database of over 500 commercially available sensors to automatically configure sensor configurations. 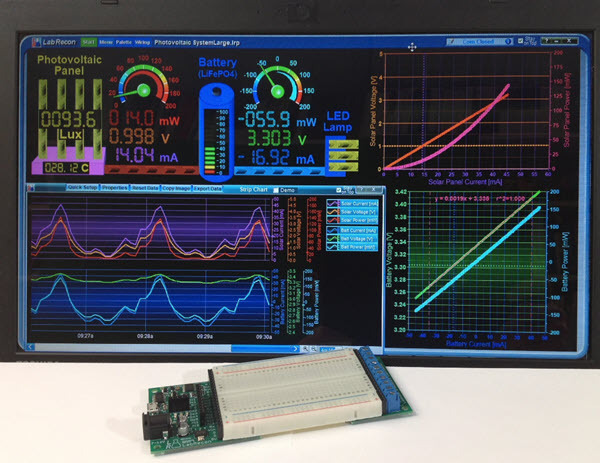 The wizard will further present circuits with component values for voltage and current measurements. "The 'Breadboard Experimentor' includes an on-board LabRecon chip, which provides many I/O options including 8 12-bit analog, frequency and digital inputs. Outputs comprise PWM, servo, frequency and stepper motor signals. Pins can also be configured to support 24-bit ADCs, 12 or 16-bit DACs and port expanders. "LabRecon also comprises a server to allow access of the GUI that one builds by computers or mobile devices. Furthermore, emails and text messages can be sent periodically or upon events. The server also includes a MQTT broker to allow MQTT clients to share data with the software." If you go to the Labrecon site you'll be blown away by the resources provided. They sent me a board; I hope to play with it soon, and will report my findings. In the last Muse I ran the lyrics to The Gates. In the same spirit here's White Collar Holler by by Nigel Russell. The only version I've heard performed was done by Stan Rogers, a cappella, and is a lot of fun. Cause no'one's gonna fold, bend or mutilate me.